U.S. threats toward North Korea are threats to all of us. Click below to email your Representative and two Senators, with a "cc" to the White House. Feel free to edit and personalize the message. 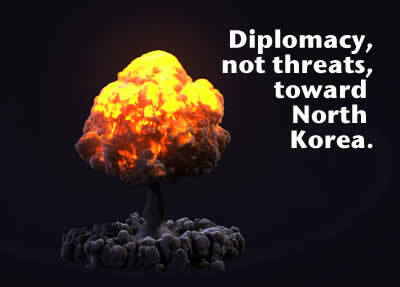 As a constituent, I urge you to publicly speak out for diplomacy not threats towards North Korea. And I ask you to please send your public remarks to me right away.